Are you looking for an alternative Christmas present for a loved one? A gift that is eco-friendly, supports an incredible charity, and offers hours of fun? How about a life-changing solar lamp that does more than shine a light, helping to transform lives in rural Africa whilst tackling climate change? SolarAid is a leading international charity that provides access to clean and affordable solar lights in rural Africa, with the goal to eradicate the kerosene lamp from Africa by 2020. To date, SolarAid has sold over 1 million lights in Africa to help tackle poverty and aid the environment. This Christmas, SolarAid aims to sell 5,000 solar lamps in the UK to help transform lives in Africa. These top of the range lights are bright, robust, give hours of clean light and some even charge mobile phones! They are the exact same lights that are helping to transform lives in Kenya, Zambia, Malawi and Tanzania today. All lights purchased include a £10 donation that will help SolarAid distribute three solar lights to families in rural off-grid Africa, allowing access to clean and safe solar lighting. There are a few lights on sale for Christmas. The 4 lamps range in price from £15 – £40 and can provide up to 36 hours of light. The £30 and £40 models both have USB mobile phone charging capabilities and all models are designed so that they can be used as a desk light, hung upside-down to brighten a room, or detached to become a simple hand held torch. The D.Light S2 is the top-selling light in Africa – a low-cost, super-robust, no-nonsense task light. On a full day’s charge this light provides four hours of light and has a battery charge level indicator to let you know when it needs charging. The in-built solar panel means that to re-charge it, you simply leave it by the window. This wonderfully versatile light makes for a great addition to your camping kit! The Sun King Eco is a wonderful little light which on a full days charge provides 30 hours of light. It has three brightness settings and comes with its own mini solar panel and a flashing LED to let you know when the light is in charge mode. The sleek design means that it can be used as a desk light, hung upside-down to brighten a room, or detached to become a simple hand-held torch. Genius! Drop it, stamp on it or accidentally splash it with water, this light prides itself in being extremely robust – perfect for festivals or camping. Who doesn’t love a green light? The Sun King Mobile has the longest light time – 36 hours. It has USB mobile phone charging capabilities – great for emergency charging at festivals. With three brightness settings, this light comes with its own solar panel and display to let you know when it is in charge mode, and how optimal the positioning of the panel is for charging. Like the Sun King Eco, the sleek design means that it canbe used as a desk light, hung upside-down to brighten a room, or detached to become a simple hand held torch. Drop it, stamp on it or accidentally splash it with water, this light prides itself in being extremely robust. The Sun King Pro 2 is a brilliant light which on a full day’s charge provides 36 hours of light. It also has emergency smart-mobile phone charging capabilities with three light brightness settings, and its own solar panel and display to let you know when the light is in charge mode, and how optimal the positioning of the panel is for charging. The sleek yet extremely robust design means that it can be used as a desk light, hung upside-down to brighten a room or it can be detached to become a simple hand-held torch. Drop it, stamp on it or accidentally splash it with water – it’s indestructible! 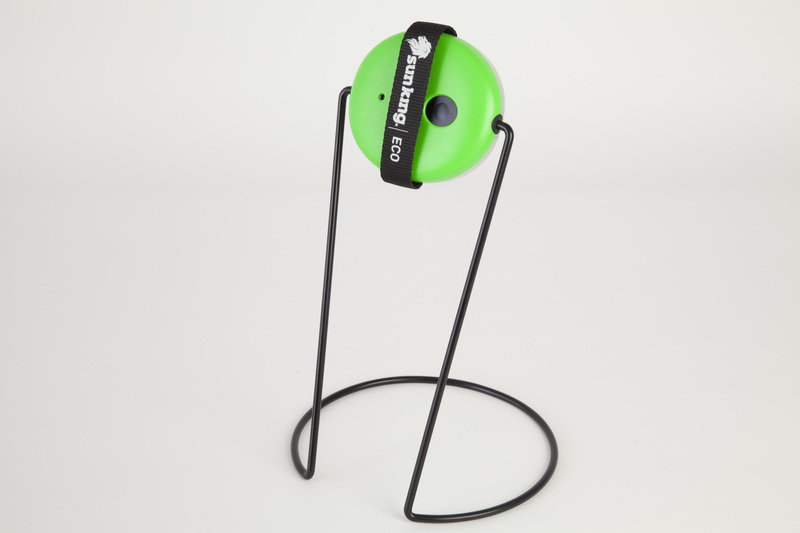 This light is a firm staff favourite, offering both lighting and mobile phone charging. It looks great too! It’s great to use in a tent, the shed or as a torch. you can visit the eco-gift shop here. Simon Toat is Absolute Gadget's long term staff writer. He is interested in all things technological.